If you are like us, then you love a good road trip! But the excitement is not about sitting in the car for hours on end, it’s the fun you have along the way. Not only do we love to explore and do a bit of Geocaching to enhance our road trips, but we also love to play some games. Especially as kids, we can remember how much fun road trip games were in the car. So we’ve put together a list of road trip games that you can play on your next trip! We’ve included paperless games, printable games, technology (app) games – and more! One of the most classic road trip games from our childhood, I Spy still makes the time go by. One person will look around the car (inside or outside) and choose an object. However, it must be something that other people can see (not a car whizzing by). They must give one clue to their object by saying “I spy (with my little eye – for kids) something that is green.” You can use other clues too, such as the letter it starts with. Others have to try and guess your object, and you can only answer yes or no. If people are truly stumped, you can give more short, simple clues. The person who guesses correctly gets to choose an object and give the clues next. You can change up the rules, or make it more of a Q&A game too. You don’t have to use M&M’s, but other kinds of candy or snacks can work too. The goal is to give you something to chat about while you are snacking. It’s an especially good way to get kids to talk about relevant topics & even for educational topics. It’s a beautiful drive – but after 4 hours this can get a little boring. Time for some games! This game is pretty straight forward. One person will choose a noun – a person, place or animal, etc. and the others must ask ONLY “Yes / No” questions and try to figure out what it is. As the name of the game implies, players must try to guess the word in 20 questions or less. The person who guesses it correctly is the winner, and gets to choose the next noun. If no one guesses correctly, then the word is revealed and the next round begins – usually with a new person. The great thing about this game is that it can also be easily adapted. One example is turning it into a “Who am I” game — where you choose a person and describe them (they can be in the car / family / or a famous person). Same 20 “yes / no” questions and rules apply. While you can play this game in teams & keep score, we always used to play it individually and informally (no score). Players need to look at road signs, billboards, shop names, anything with letters on it (even stickers on cars) to try and spot letters in the correct alphabetical order. For example, the first will be “A” then “B”, etc. Spot the letter first and you get a point, then move on to the next letter. It really depends on who is in the car, and where you are driving. 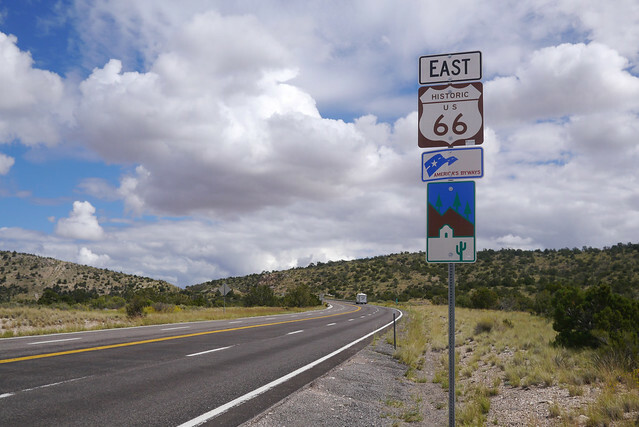 Driving in the dessert in Nevada is going to leave you without many signs! This classic TV game show requires people to guess the name of the song, with only hearing just a little bit of it. You can use singing, whistling, humming, or you can use your car radio with the “seek” button to randomly pick stations. You can also use iPods and phones to quickly access music and parts of songs. The person who guesses it first gets to choose the next song. The great thing about this game is that it can often turn into a bit of car-karaoke! So get out that video camera (or camera phone) to be sure that you capture these moments! Last-Letter Word Game – Warning, Can Make Your Brain Hurt! This game can be played in many different ways. However, the main rule is the same. Say one word, example “mountain” and the next word must start with the last letter of the previous word — for example, “nail” — and then next, “lipstick.” And so on. You can keep it random, saying any word that pops into your head or you can focus it on a topic; such as food or geography. You can also narrow the words to things you can see in the car, or out the window. You may choose to go around in a circle, and whoever is stumped is out. Or you can have anyone chime in with an answer and score points. Driving the 7 Mile Bridge in the Florida Keys – an awesome road trip! This one is similar to the previous Word Chain-Letter game; however, rather than using the last letter for the new word, you must use some relatable attribute. For example, if I say “ocean” you could say “blue berries” because they are also blue like the ocean, and the next person could say “lemon” because it is a fruit. This game can get a little out there, but it can test your ability to find things in common with other things, and lead to some fun banter in the car! Who doesn’t like a good story? Well, these stories can get a little ridiculous…which is what makes them fun! One person in the car creates the first line of a story. Then it goes to the next person, who adds another line to the story. And on and on it goes. It’s amazing how a story can get totally off track, and then sometimes come full circle! Other times, they are just a crazy mess of nonsense! But that’s what makes it fun. You could make the game more difficult by creating additional rules, such as rhyming, or instead of going in a circle, choose people at random. For little kids, you could also have them illustrate the story! This is a fun game to get people to think positively, but it can also be a good way to get them thinking creatively too. Statements can be mundane, like “I’m out of chips” or something totally unreal, like “unfortunately a bear is going to attack us” and another person can say “fortunately, I can use my Kung Fu Panda skills on him!” It also gives people a chance to be funny, and come up with some quick-witted comebacks! This game seems to be the most fun when the statements are silly or unreal. However, you can make some more serious statements too — depending on the people in the car. While the previous games are easy to play on the fly during a car ride, these next games will require a bit of preparation. These printable road trip games are great to have on hand, in case you feel the urge to play while on the road. This was also a popular game in Liz’s family growing up. There are many different variations of the license plate game. 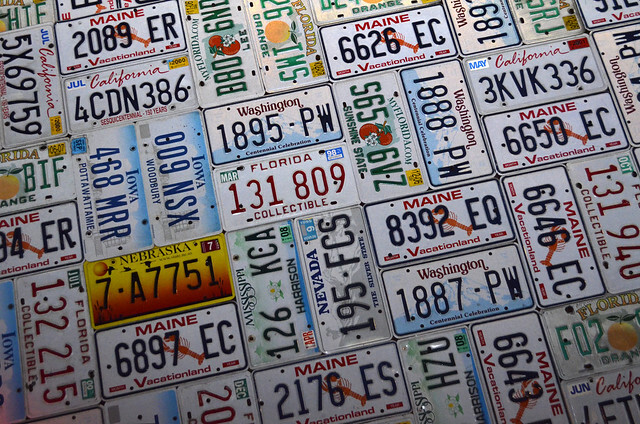 Basically, your goal is to find license plates from all the different US states (if you are traveling in the States). You can print out a sort of Bingo card for players to fill out during their trip. People can try to get a straight forward bingo, or a “blackout” kind of bingo. Another way of playing this requires less preparation — just a blank piece of paper. As you see license plates from other states, just write them down. At the end of the trip, see how many you have found. A classic game anytime you have time to kill. This simple game requires people to think of a situation – usually undesirable. They have only 2 choices, and they much choose which they would rather do…and explain why. For example, you are starving in the woods and desperately need food. Would you rather eat bark from the trees and leaves, or eat spiders and insects? While you can think of situations off the top of your head, it can be really hard to think of more than a few on the fly. If you have this game at home, you can simply bring the cards along in the car with you. However, there are also many websites where you can go to print off situations. Another option is to use an smartphone app to automatically generate situations / questions for this game. Everything is more fun when it’s outside the classroom. This is especially true for Geography, since you are in the real environment. There are so many ways you can play this game, it really depends on your situation. Basically, you choose different topics such as states, capitols, landmarks, rivers, lakes, attractions, etc. and people have to spot them. These items can be on cards that you choose, or on a piece of paper that you just run through during the trip. You can also turn it into a bingo game or a photo scavenger hunt too. This game is more dependent on the ages of the travelers, and how much work you want to put into it in advance of the trip. It can be hugely educational for kids especially, and a fun way for parents to keep their kids engaged and learning during trips to historic places. Similar to the real battle ship game, this game is much more travel friendly! Rules are the same, except you have square boxes where you can place your ships by drawing a border around the boxes where the ships would be. You must use specified number of squares for each ship. Then take turns firing on each other and use “X” for a hit, and dots for a miss and plot on your paper. You can make your own board – using numbers and letters to label the squares across and down (A4) — or you can use this pre-made Battle Ship game PDF that we found online or purchase a travel sized version of the game. While there are a number of websites out there that offer different printable games that you can bring with you on a road trip, we found a lot of printable games on Mom’s Minivan (such as the Battle Ship game from above). There are some positives to having so much technology in our lives. And one of those is that we now have quick and easy access to games and activities on our phones in the car. No, I don’t mean that people should sit in the car and play on their phones — individually. I mean, using the phones as a way to play a game together, or to enhance a game you are playing in the car. The very best part about these games is that they don’t require any type of planning, and they are full of information (words, cards, topics, etc.) that you can use on the fly! Technology-based games and apps are awesome for road trips – as long as you play together! We love trivia! Whenever we are traveling, we love to do simple question and answer games, like trivia. It could be able a topic, a destination, etc. There are many trivia games out there, and it’s easy to do a search and download them. What a great way to have access to so many questions – without having to do any prep work of printing paper or bringing a bunch of cards with you in the car. Similar to “catch phrase” (one of our favorite party games), there are many guessing game apps for your phone. They show you different words and you have to describe them. Again, a great way to have access to so many words / topics without having to think them up on your own. Ah yes, not only do we love trivia games…but we love facts! There are a lot of apps out there full of unique, interesting, or downright useless information. We love just scrolling through these in the car when we want to kill time. It’s especially fun if it is related to the destination where we are driving, because it an add an interesting element to the drive. While it’s not totally a game, it is pretty interesting and can create some great conversation in the car! Like the “Would You Rather” game mentioned above, there are apps and websites out there that will give you different hypothetical situations to work with. Great for creative minds, and some good laughs! More Awesome Road Trip Game Apps! Here’s a quick list of some of our favorite Road Trip Game apps, and links for you to download. We always play games when we travel, whether it’s in the car or relaxing on the beach or at a hotel. The key with travel games is that they are easily packable. There are a number of great travel games on the market, but some games can also serve dual purposes — giving you more options. Below are some of our favorites. Dice — bring a set of 6 dice because they can be used for numerous games. Of course, we like to typical “10,000” game but there are many other games you can play with a few dice. Poker cards – we all know these can be used for more than just poker. From Rummy, to Go Fish, to Old Maid, if you are creative then you can make hundreds of different games with one deck of cards. Have Fun On Your Next Trip With These Road Trip Games! We hope you have a blast trying out some of these games on your next road trip. Be sure to comment with your own game ideas, and [social_share] this post with your friends. Happy travels! Perfect weather for cruising in the convertible through the Florida Keys – on the way to Key West!